There are a lot of factors that go into play while Building a PC. And if you want to step a notch, you can put a little dazzle to your system. Apart of Water Cooling system or the modified Cases, RGB lightning is also a great tweak to your system. Today, we’re going to discuss everything you need to know about RGB motherboards. First, we’ll go over our top picks for RGB motherboards, and explain why each pick made it on this list. After that, we’ll explain things you should know before buying and address common questions on this topic. 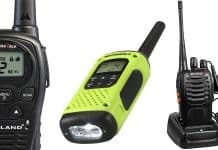 If there is anything that we leave out, feel free to comment below and ask for more information. What makes an RGB motherboard different? 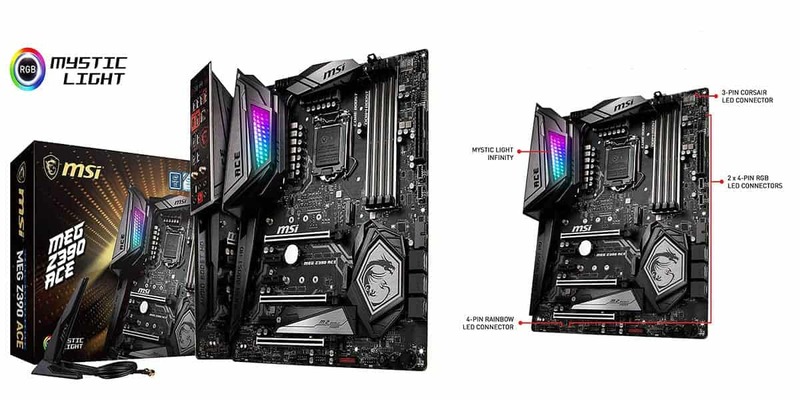 Of the RGB motherboards on this list, the MSI MEG Z390 ACE is definitely one of the most fully-featured. Before anything else, let’s talk about the RGB aspects of this motherboard. In terms of lighting that’s on the motherboard itself, all of it is on a single array of LEDs by the I/O. This is called a Mystic Light Infinity array, and it offers the full gamut of RGB customization possibilities. 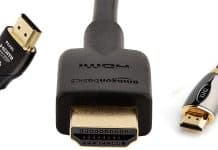 More importantly than the motherboard lighting is the available connectors for other RGB lights, of which there are plenty. There are four total connectors available for RGB LEDs, including one dedicated to Corsair LEDs. Corsair is particularly well-known for their RGB peripherals and components, up to and including RGB RAM and liquid cooling. Corsair’s RGB line is significantly more popular than RGB products from other companies, so this support is very welcome for RGB enthusiasts. Besides the Corsair-dedicated connector, there are also two 4-pin LED connectors and one 4-pin Rainbow LED connector. Altogether, you have a ton of room for RGB case fans, coolers, LED strips, and more here. Aside from RGB, the underlying motherboard tech is no slouch either. 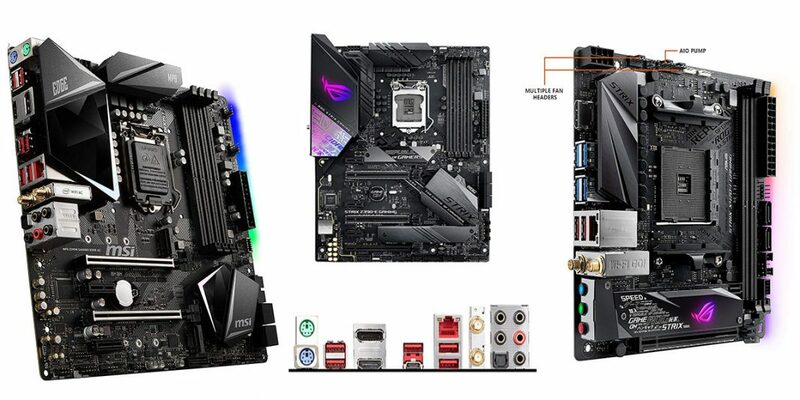 This is a fully-fledged Z390 motherboard, including bonuses like USB 3.1 Gen 2 and built-in Wi-Fi. There are no compromises to speak of here. Remember how we said no compromises? We meant no compromises, including in budget. This is also the most expensive of the RGB motherboards on this list. While it’s certainly one of the best RGB motherboards, that still may not justify the $270+ asking price here, especially when other Z390 motherboards can be found for cheaper. 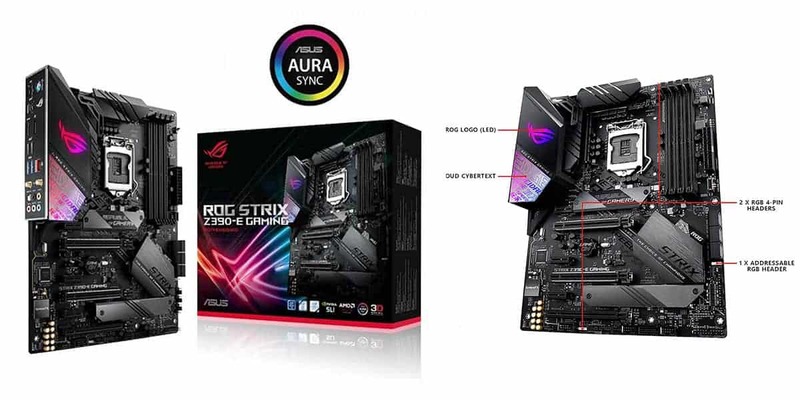 In terms of RGB lighting, you have plenty of options here on the ASUS ROG Strix Z390-E. Before we dive into anything else, we’re going to focus on the onboard RGB lighting, as well as the available connectors. First and foremost, the onboard lighting. By the I/O, you’ll find an RGB ROG logo and text. This is all you’ll see in terms of onboard RGB lighting, but it should be just fine: it leaves more room for things like RGB coolers and RAM to shine in your system. Physically, you have 2 4-Pin RGB headers and 1 addressable RGB header. In terms of software, ASUS AuraSync is one of the best on the market. Most of your RGB components should be compatible with this board, though RGB RAM may be hit-or-miss. Be sure to do extra research before buying to be safe- and consider an RGB controller if you want to be sure. 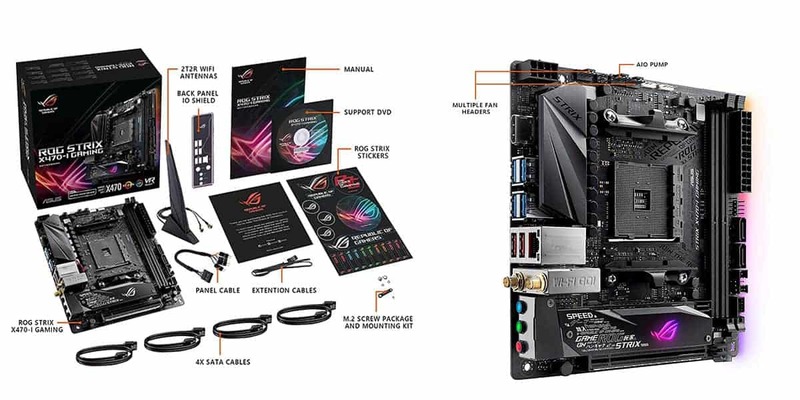 As a motherboard outside of RGB features, the ROG Strix Z390-E is the fully-featured motherboard you’d expect at this price point. If you’ve been reading through the entire article in one stretch, you may notice a pattern here. These motherboards come at a price premium, to say the least. However, this is a part of the sacrifice that comes with RGB…and this one usually retails around $230-ish, so it’s not as bad as it could be. If you’ve been reading this article in its proper order, you know our first priority is RGB. 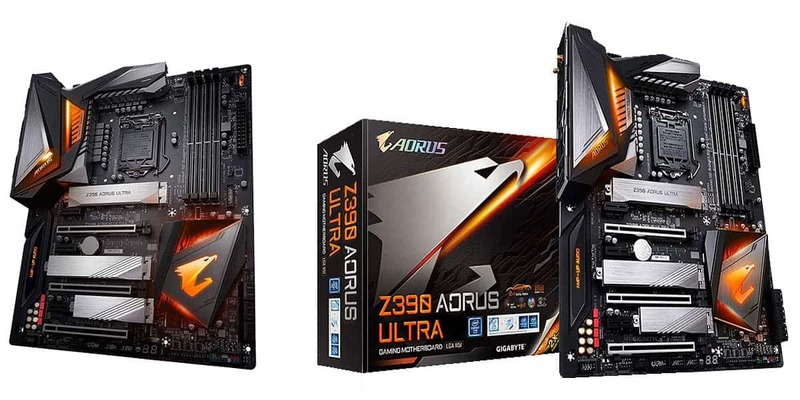 Let’s dive into the Gigabyte Z390 AORUS Ultra and discuss its RGB capabilities. First and foremost, the onboard RGB lighting. This is one of the most extensive RGB lighting solutions we’ve seen on a gaming motherboard, featuring RGB lighting on the chipset and the I/O shield. This effectively spreads out the RGB lighting, allowing for an even more in-depth lighting solution for RGB fanatics. In addition to onboard lighting, your typical header expectations are met here. There are two addressable RGB LED headers, and 2 standard RGB LED headers. These should provide plenty of room for compatible hardware, especially Gigabyte’s own. Aside from RGB, you have a perfectly solid Z390 motherboard here: arguably the best one overall if expansion is your top priority. With three PCI Express lanes and 3 M.2 slots with dedicated heat shields, you have plenty of room for added GPUs and high-speed M.2 drives in this system. Like our other top picks for RGB motherboards, this one is expensive. Expect to spend at least $230 on this one, sometimes more. Unfortunately, that isn’t the only issue here: Gigabyte’s RGB component support is also notably more limited than MSI or ASUS’. Most things- including Corsair’s RGB RAM- should work fine, but not everything will. We recommend double-checking more thoroughly for compatibility if you choose this motherboard. The MSI MPG Z390M Gaming Edge AC is our pick for best RGB Micro ATX motherboard. If you’re thinking on a surface level, you may be confused at first, there is no surface RGB lighting on this motherboard. There is, however, rear glow lighting, which we would argue is much better for illuminating your case. An RGB glow coming out of the back of your motherboard, in addition to whatever other light is coming from your RGB components and fans, should look amazing, especially in a dark room. Besides the onboard RGB lighting, you also have support for 4 RGB headers. Specifically, 2 4-Pin RGB LED headers and 2 4-Pin Rainbow LED headers. There is no Corsair-exclusive header here like on the previous MSI board on this list, unfortunately, but this should still serve perfectly fine for your M-ATX RGB setup. Additionally, you still have an incredibly solid- and cheap!-motherboard here. Full Z390 features, built-in Wi-Fi, two PCI Express slots for most users, this will be more than enough for a great experience. Honestly, we have issues calling out issues with this one. We can’t complain about the price- in fact, this is the cheapest option on this list by a considerable margin. Despite being Micro ATX, it’s not like it offers much less in the way of features either. You can still do a dual-GPU setup (even though those have mostly died out in 2019), and you still have 4 RGB headers, except without 1 reserved exclusively for Corsair. 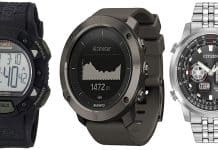 This is an upside or a downside, depending on who you are and what hardware you’re equipped with. If you’re real serious about extra PCI cards and drives, then this board may be a problem for you. Otherwise, it’s smaller and has pretty much all the same features and is cheaper. That’s tough to beat. Last but not least is our pick for best Mini ITX RGB motherboard. This is the ASUS ROG Strix X470-I, and we think it should provide the best RGB experience for an ITX build. First, let’s talk onboard lighting. On the front, you have an RGB-illuminated ROG logo. More importantly, you have a rear glow emanating from the back, ensuring that your case has awesome RGB mood lighting. The rest of your RGB lighting will need to be through either your peripherals or a lighting controller, though, since this board only offers 2 RGB LED connectors. In motherboard terms, you have a fully-featured ITX motherboard. This comes with downsides due to the form factor (which we’ll discuss below), but if you’re an experienced builder and only plan on running the one GPU, you should be fine. This is the smallest RGB motherboard on this list, but it also comes with the most caveats. First and foremost, you aren’t really saving money with this one. It isn’t much less expensive than standard-sized ATX RGB motherboards, and in fact, it’s more expensive than our Micro ATX pick despite having fewer options for building and expansion. Next, we need to talk about the limited headers here. There are only two total RGB headers available on this board, which greatly limits the amount of RGB customization you can do without added RGB controllers. While this isn’t necessarily the fault of ASUS (it is an ITX board), it’s still an important downside to keep in mind. Finally, there’s just the fact that it’s an ITX motherboard. This will make it harder to build with than an ATX or Micro ATX motherboard, especially if you’re building in a smaller case. This is an expected downside, but still one worth noting in case you’re new to building. The main difference introduced by an RGB motherboard is the addition of RGB lighting. While RGB lighting generally uses LEDs, it is specified as “RGB” due to the lights having access to the full RGB color spectrum, as opposed to just one color. Some products sold as “RGB” may have a limited palette or no control options at all, but don’t worry- we don’t recommend those in this article. In addition to the basic addition of RGB lighting, there are other factors to take into consideration. With some motherboards, the implementation of RGB lighting can be minimal, only illuminating a single word on the motherboard. Other motherboards may opt for a backlighting approach- that is, RGB on the back of the motherboard that shines out from behind it, into the case. In this article, we’ve tried to opt for more complete RGB motherboard lighting implementations. There’s no point in paying extra dollar for a feature like this if you aren’t going to go all out, right? In this section, we’re going to discuss RGB motherboard compatibility. Specifically, compatibility with different lighting software, as well as other RGB peripherals or components inside your system. Unfortunately, this is probably one of the most complicated parts of creating an RGB PC build. Allow us to explain why. And since all the standards are competing,it’s a bit of a mess. Now, even in the worst case, you should generally be able to get all of your components working. 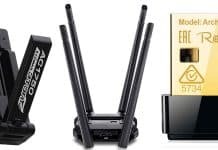 Peripherals can be controlled inside the operating system with software from their respective vendors, even if the motherboard itself does not support them. RGB fans and cases will also come with their own RGB lighting controls, which can also be used to circumvent motherboard compatibility issues. However, if you want a truly unified lighting profile…you’re going to need to do a lot of extra research. Different motherboard RGB software will support different components and peripherals, and if you want lighting unified across all of these components, you’ll want to make sure it’s all compatible. Below, we’re going to list our top picks for motherboard RGB sync software and what they’re usually compatible with. 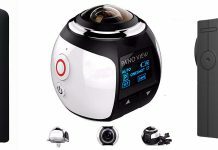 You’ll also be able to find a list of compatible brands and products on each of the pages linked below. 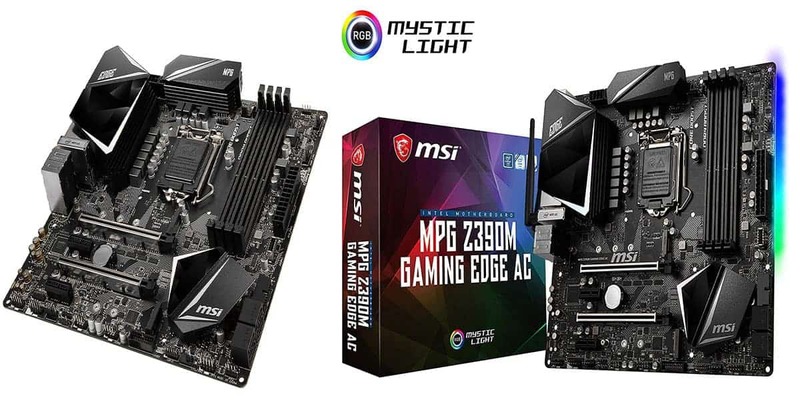 MSI Mystic Light – MSI’s RGB lighting solution, which also enables control of RGB lighting on their RGB graphics cards. Compatible with brands like Corsair, BitFenix, Antec, G.SKILL, InWin, and more. ASUS Aura – ASUS’ RGB lighting solution. Compatible with brands like Corsair, InWin, NZXT, and more. Gigabyte RGB Fusion – Gigabyte’s RGB lighting solution. Focuses most support on Gigabyte products, but also compatible with some products from brands like Corsair, HyperX, G.SKILL, and Cooler Master. Do motherboards impact gaming performance? Short answer, no. Not at all. Long answer, sometimes, but not directly. The only way that a motherboard may impact gaming performance is based on what technologies it supports. Modern motherboards will all have at least one PCI Express 3.0 slot available for your graphics card, so that should always be fine. Where things may change is with memory– lower-end motherboards won’t support high memory overclocks or high memory speeds, which can be a problem if you’re buying high-end RAM. There is also the chipset, which determines whether or not your CPU can overclock, as well as other hardware features. CPU overclocking can certainly have an effect on gaming performance- a great one with high overclocks. Basically, your motherboard won’t directly affect your gaming performance in any meaningful way. It may inhibit the speed of your RAM or CPU, but only if you don’t buy a motherboard with a high-end chipset. Will an RGB motherboard perform better than a normal motherboard? An RGB motherboard may have better build quality than your typical motherboard, however. Motherboards with RGB also tend to come with higher-end chipsets and price points, which will be better than cheap motherboards with entry-level chipsets. Can I get other RGB components or peripherals to match my motherboard? There are a ton of options for RGB mice, keyboards, headsets…even RAM and GPUs! Will my other RGB components and peripherals be compatible? We recommend scrolling on up to our compatibility section and doing some Google-Fu to verify compatibility with your build of choice. This question is a bit too general for a cover-all answer, unfortunately.